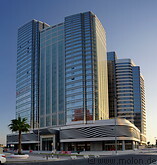 The urban centre covers almost the entire ABu Dhabi island and consists of modern buildings, of which many are skyscrapers. Most tall builings are located in the northern part of the island. The streets are wide, with multiple lanes and are laid out in a rectangular grid pattern. Abu Dhabi is one of the greener cities of the United Arab Emirates, as it contains many parks and other green areas. The city is still undergoing a rapid development, with construction ongoing in several areas. As a consequence the street layout changes.